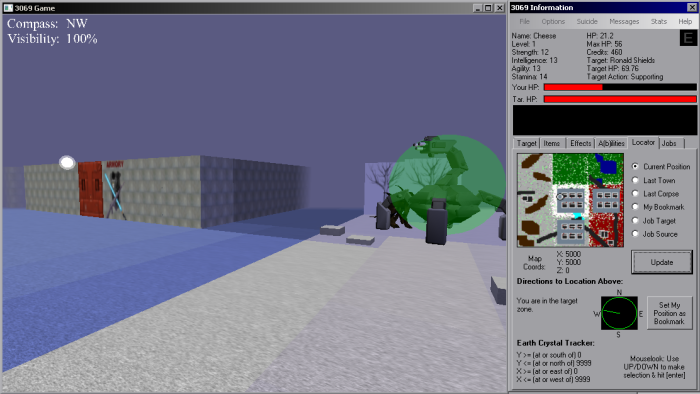 3069 is a fully featured, 3D futuristic free role-playing game for Windows. The year is 3069. Earth has since been destroyed by a catastrophic geothermal experiment. Fortunately, you and many others were safely relocated onto planet Esperanza before the blast. Small remains of Earth scatter the galaxy, some falling onto Esperanza's surface creating a valuable commodity. Scientists theorize that a tiny crystal within the Earth's Core also landed on Esperanza. This crystal can be used as a seed to generate a new planet to sustain life like Earth once did. However, evil forces do not want to see another Earth generated and hope to keep Earth's inhabitants stuck on Esperanza forever. Good luck in finding and returning the Earth's Crystal.